Be good to your bed by banishing smelly, unsightly messes with a few household staples and these smart techniques. A good mattress is a big-ticket purchase, but stains—from bodily fluids to breakfast-in-bed accidents—are often inevitable. What’s more, in most cases a visible stain will void the warranty on your mattress. So, protect your investment by making regular cleaning and stain removal part of your housecleaning routine. It’s easy to do, involving everyday ingredients that you no doubt already have hiding in your cleaning caddy. 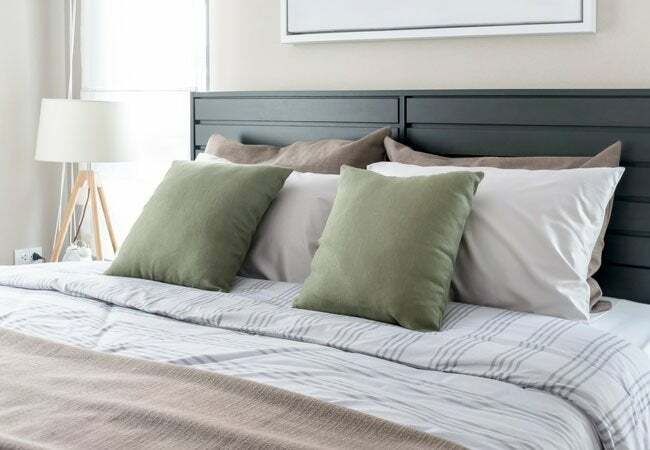 Here, we’ve laid out the essential formulas for how to clean mattress stains so that you can quickly banish any of the most common mattress mishaps (and rest easy once more). Prep the mattress for stain removal by stripping all bedding and sheets. Give it a thorough vacuuming with the upholstery attachment and, as a “while you’re at it” measure, employ the crevice tool around all the piping, where dust and hair collect. Dust and hair may not be related to the stain you intend to treat, but removing them keeps down the dust mite population, which is especially important to restful sleep if you’re an allergy sufferer. 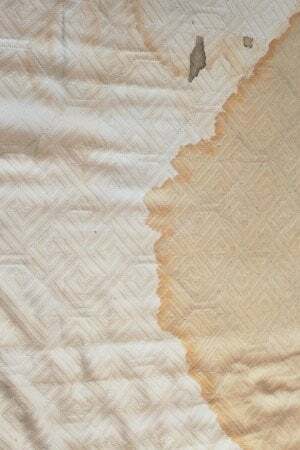 How to clean mattress stains will depend on the type of stains themselves. Target each stain with the appropriate cleaning technique. • Urine, sweat, and vomit: These bodily fluids are the most likely culprits for mattress messes. Unfortunately, you can’t soak a mattress as you would a piece of clothing; rather, you must use liquid sparingly, with a spray bottle, in order to avoid turning its slow-drying cushiness into the ideal damp conditions for mold and mildew growth (yuck!). First, gently mist the stained area with plain water until just slightly damp. Then mix one cup of 3 percent hydrogen peroxide with three tablespoons of baking soda and a few drops of dishwashing liquid in a spray bottle. Mist that solution over the stain, and gently brush with a soft scrub brush or old toothbrush until the stain is gone. Finally, mist the cleaned area with fresh water and blot with an absorbent towel. • Blood: Banish blood with the technique above, making sure that the water and cleaning solution are both cold (hot will set the stain in for good!). Put the hydrogen peroxide-baking soda solution in the fridge for an hour or so after mixing to bring the temperature down. You’ll likely need to use extra brushing action on blood stains and may need to repeat the procedure more than once. Blot up all the excess liquid with a clean, absorbent towel. • Food and drink stains: For coffee, red wine, or other food and beverage bloopers, mix one part laundry detergent, one part vinegar, and 10 parts water in a spray bottle. Mist the stain and agitate with a soft scrub brush or toothbrush. Give the solution 10 to 15 minutes of dwell time. Then blot with a wet hand towel or sponge to remove the stain and the cleaning solution. Rinse the towel/sponge and continue blotting as necessary. Then blot with a dry absorbent towel to remove any excess liquid. To deodorize the mattress, sprinkle the cleaned area generously with baking soda. This will help to draw out unpleasant odors while absorbing any remaining moisture. Allow the mattress to sit for up to 24 hours, if possible, so it can dry completely (plan to sack out on the sofa or another bedroom that night). Or if time is of the essence, you can use a fan or a hairdryer on the cool setting to speed things up. Once the mattress is completely dry, vacuum up the baking soda and make the bed. You’ll rest well knowing that your mattress is stain-free and daisy fresh!